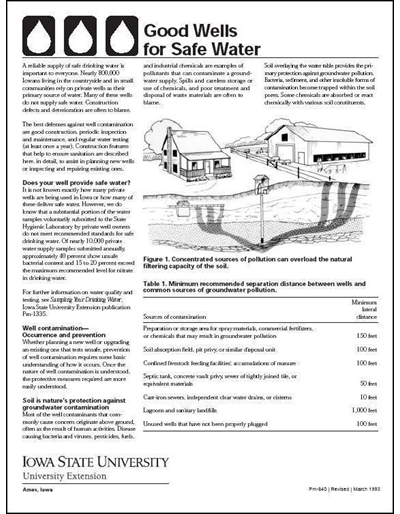 Soil judging consists of evaluating certain properties of a soil and interpreting these evaluations for land use recommendations. This score card provides space for recording both the choices made and the scores earned by the contestants in soil judging contests. 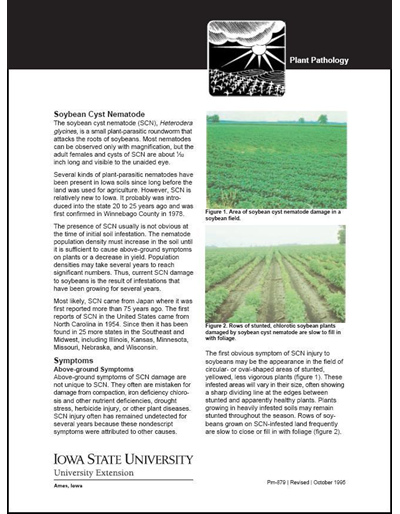 Learn about how to sample for nematodes and control them. 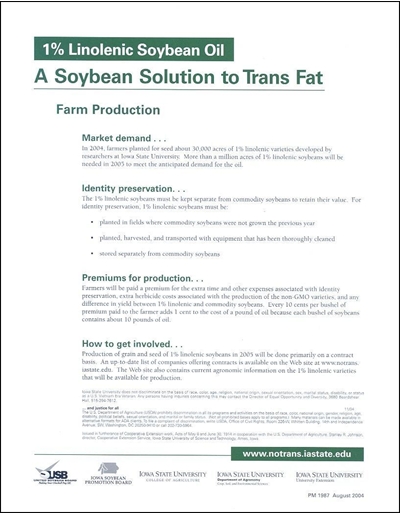 Read about this no-trans-fat soybean oil, an alternative to hydrogenated oils. 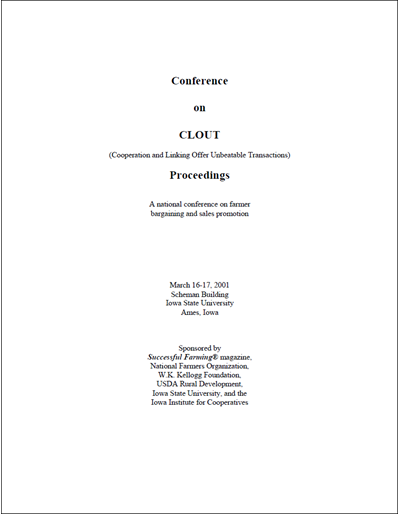 Contains a complete transcript of the speeches and presentations given at the CLOUT conference, March 16 - 17, 2001, at Iowa State University. 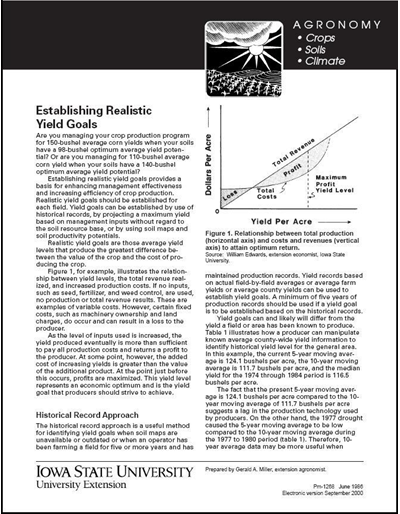 Establishing realistic yield goals provides a basis for enhancing management effectiveness and increasing efficiency of crop production. 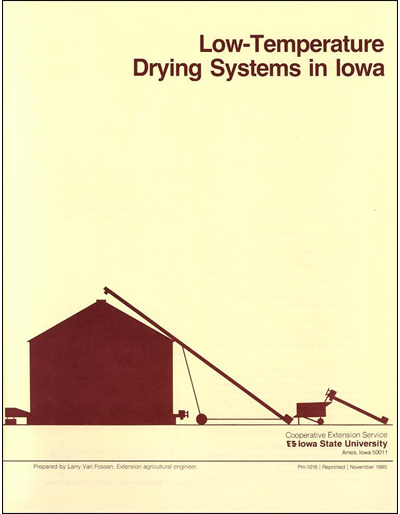 This publication discusses many of the most important decisions you need to make to successfully develop and use low-temperature grain drying systems in Iowa. 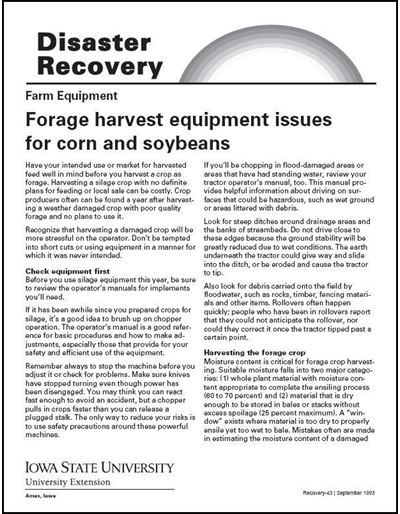 The information about selecting equipment and operating the bin is appropriate only for corn, and similar for grain sorghum. Details on the future success of: commodity farms, product farms, direct market/specialty farms, and multiple-income farms. Part of the fun of gardening is in starting your own plants. 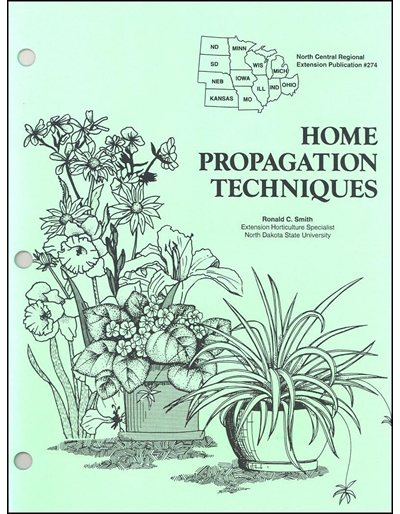 This illustrated guide summarizes what you need to know about propagating plants from seeds, cuttings, divisions of tuberous roots, ground and air layering, and grafting. 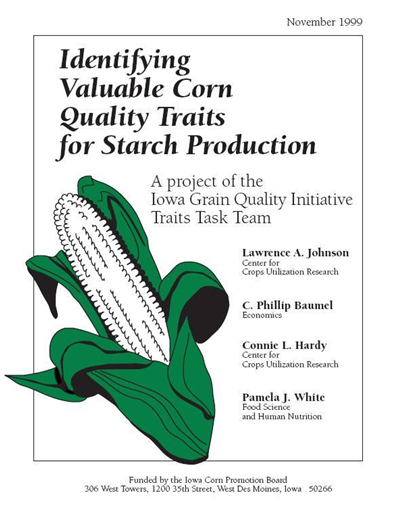 This report is prepared by the Iowa Grain Quality Initiative Traits Task Team. It summarizes possible corn modifications to achieve new starches. Poor ventilation in modified open-front buildings often causes pigs to give less than optimal performance. 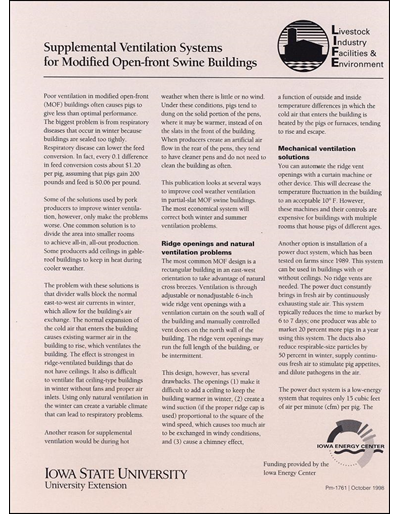 Read about and view figures of how to modify open-front buildings. The nutritive quality of a standing crop declines both as it matures and as it is affected by spoilage microorganisms in high-humidity conditions. Find out more in this Q and A format publication. 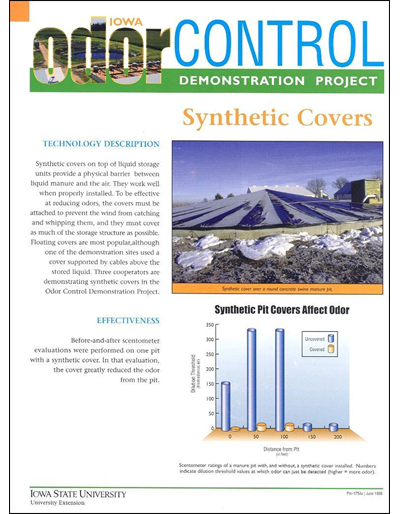 This 1998 publication discusses synthetic covers on top of liquid storage units that provide a physical barrier between liquid manure and the air. Learn about their effectiveness in controlling odor. 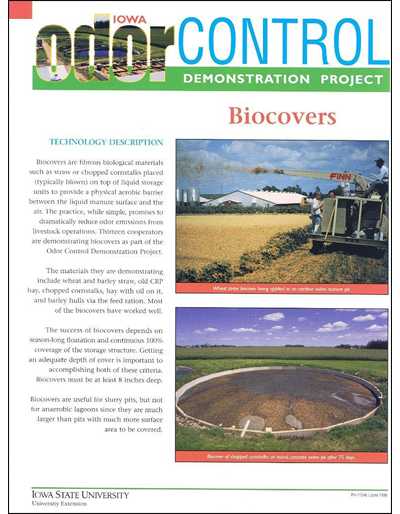 This 1998 publication discusses biocovers. They are fibrous biological materials such as straw or chopped cornstalks that are placed on top of liquid storage units to provide a physical aerobic barrier between the liquid manure surface and the air. Read about their effectiveness. 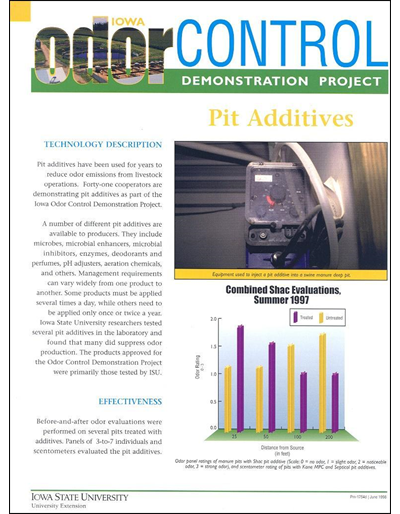 This 1998 fact sheet discusses different pit additives and their effectiveness. Pit additives have been used for years to reduce odor emissions from livestock operations. 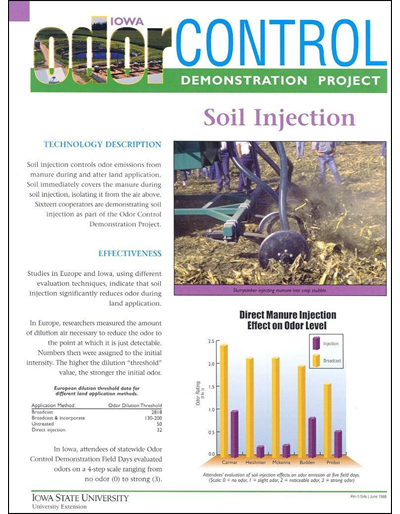 This 1998 publication discusses soil injection to control odors from manure during and after land application. Soil immediately covers the manure, isolating it from the air above. Read about effectiveness. 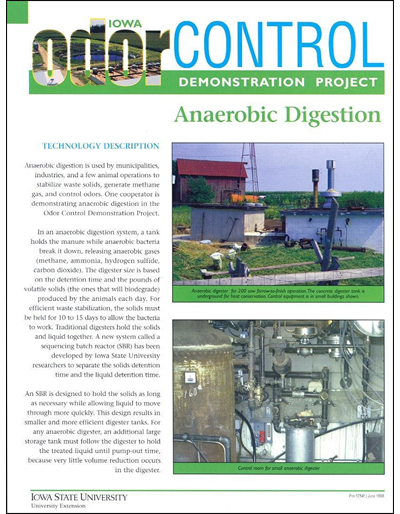 This 1998 publication discusses anaerobic digestion to stabilize waste solids, generate methane gas, and control odors. Read about its effectiveness. 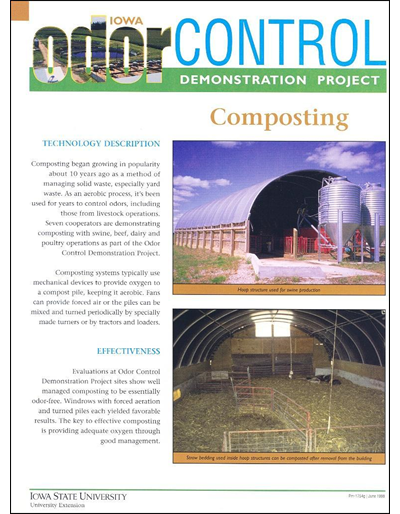 This 1998 publication discusses composting. It is an aerobic process that has been used for years to manage solid waste and to control odors, including those from livestock operations. Read about its effectiveness. 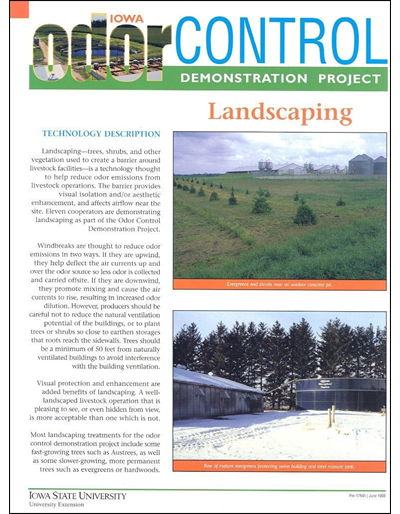 This 1998 publication discusses landscaping as a barrier that provides visual isolation, aesthetic enhancement, and affects airflow near the site, reducing odor emissions from livestock operations. 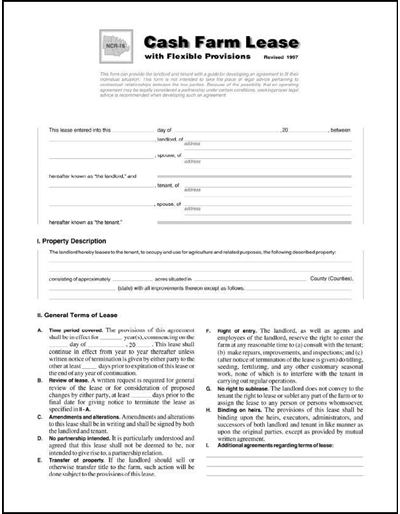 This fact sheet provides information on effectiveness. 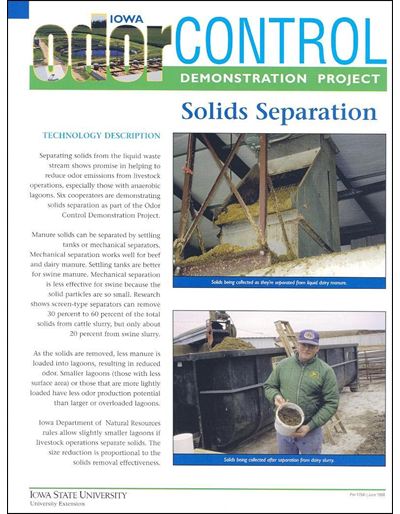 This 1998 publication discusses separating solids from the liquid waste stream. 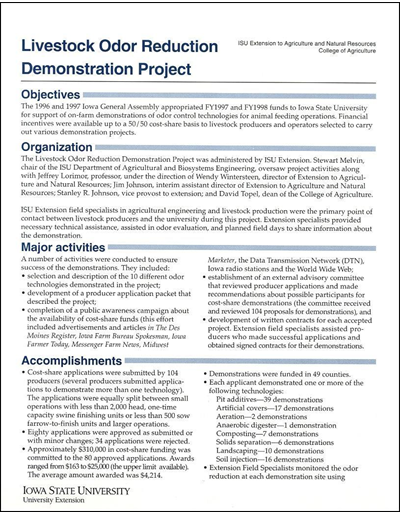 This shows promise in helping to reduce odor emissions from livestock operations. Read about its effectiveness. 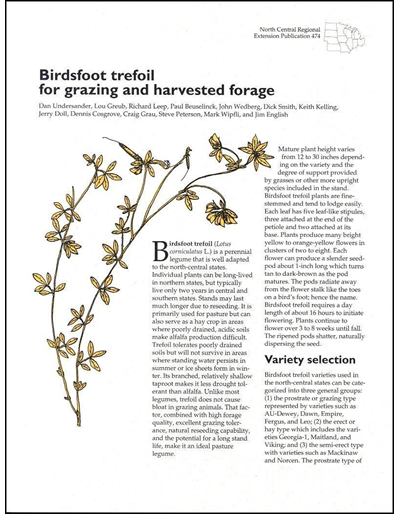 Birdsfoot trefoil has become a favorite legume in permanent pastures in Iowa because of its longevity, ability to withstand close grazing, high nutritive value, and non-bloating characteristics. 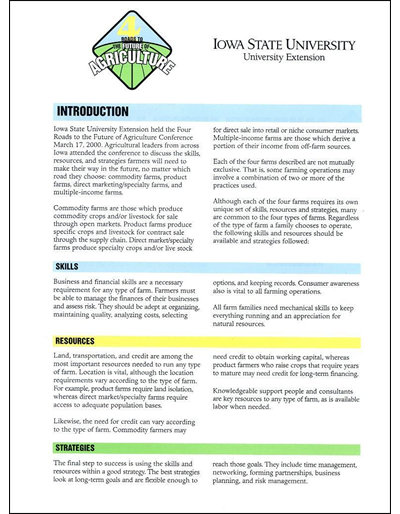 Topics include: adaptation, performance, interseeding, and seeding vigor/forage yield of the carroll, leo, dawn, and empire varieties. 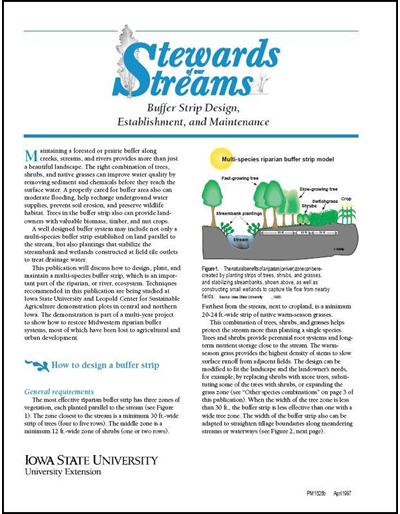 This publication discusses how to design, plant, and maintain a multi-species buffer strip, which is an important part of river ecosystems. 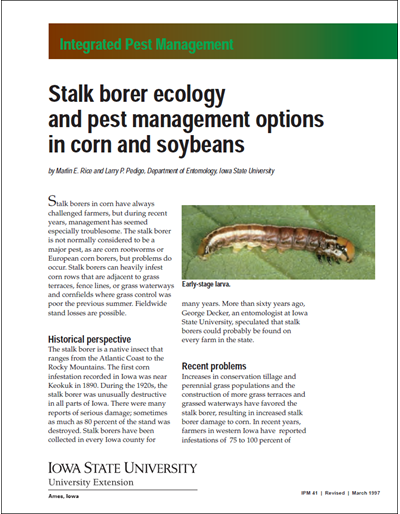 Stalk borers can heavily infest crops that are adjacent to grass terraces, fence lines, or grass waterways and cornfields. Cultural and chemical management techniques are discussed. Although some producers may think about using low rates of fertilizer to reduce input costs, this can adversely affect yields if soil fertility drops below optimal levels. Read about the research to help your decision-making. 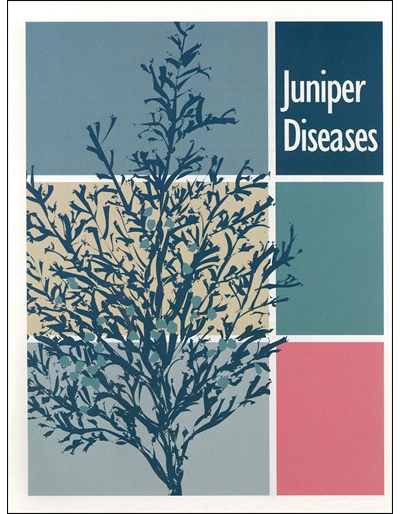 Help with identification and control of the most common juniper diseases. 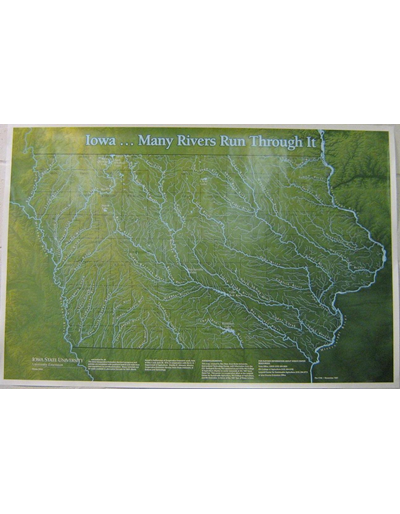 Color photos and tables. 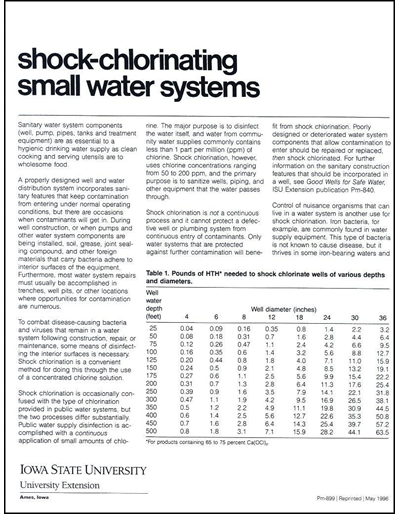 Learn how to shock chlorinate a small water system to combat disease-causing bacteria and viruses that remain in a system following construction, repair, or maintenance. 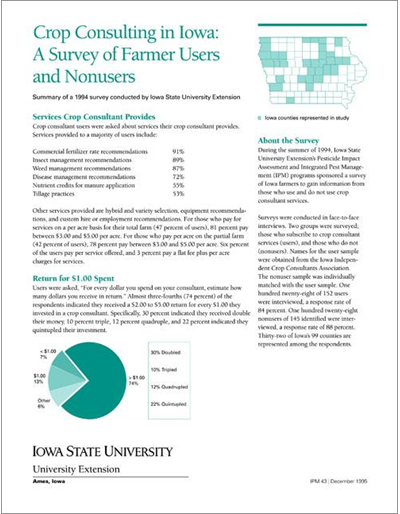 The differences existing between those who use crop consulting services and their neighbors who do not, reveal several benefits gained from crop consultants. 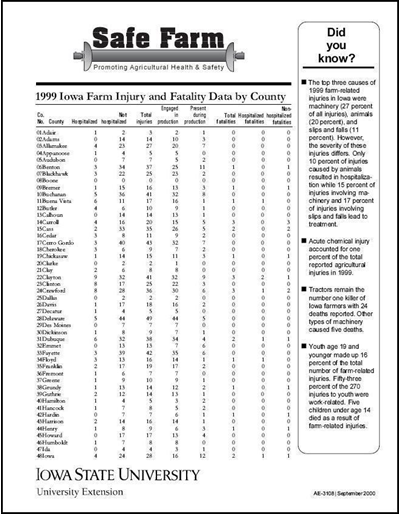 Survey done in 1994 by Iowa State University Extension’s Pesticide Impact Assessment and Integrated Pest Management programs. 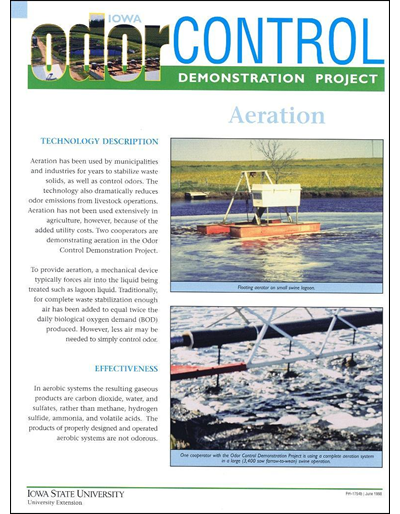 This 1994 publication provides basic information on cation ratios, their history and early development, cation ratios in soil, and cation ratios in crop production. The most common cause of well water test failures is bacterial problems caused by well deterioration. 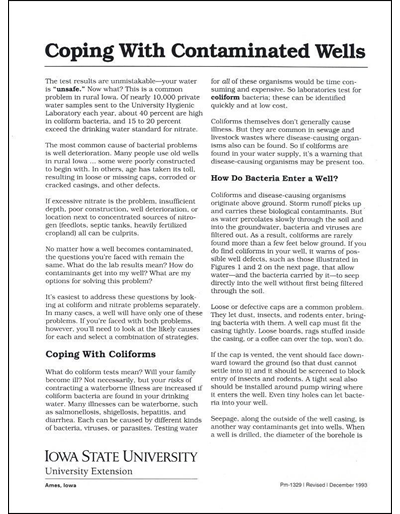 This publication addresses how to handle contaminated well issues by looking at coliform and nitrate problems. 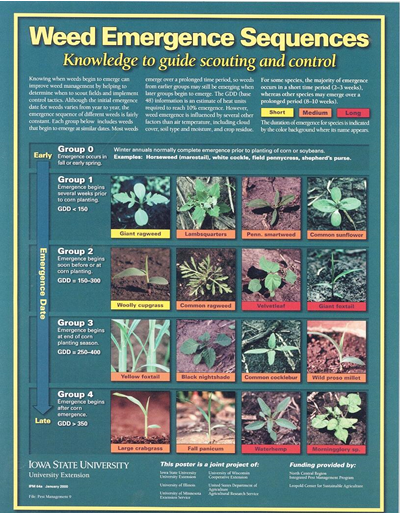 Find out about variety selection; establishment management; production management; and management of weeds, diseases, and insects for Birdsfoot trefoil in this 1993 publication. 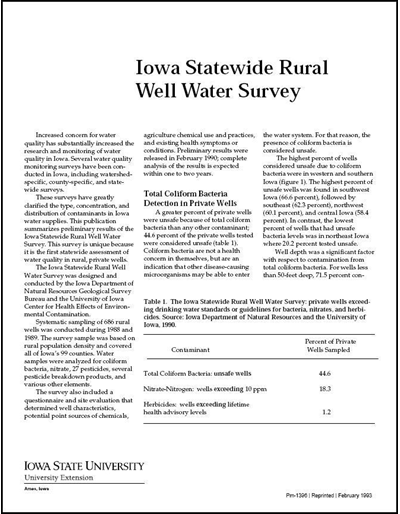 Historical data regarding preliminary results from a sampling of 686 Iowa rural wells conducted in 1988 and 1989. 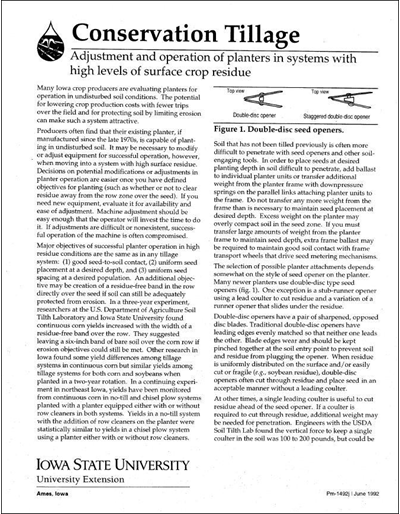 Information to help you match your planter operation objectives to various modifications possible to a row crop planter. 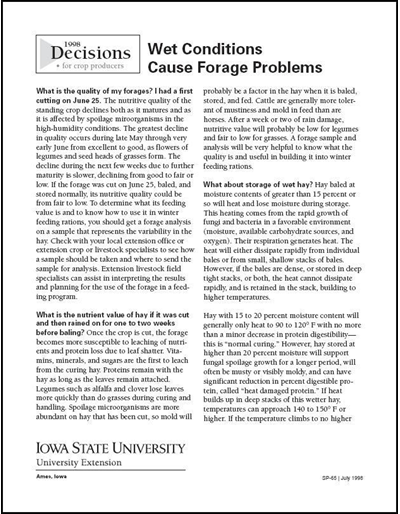 There is no standard method to determine corn shrinkage. 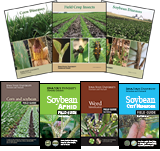 This publication describes several popular methods, provides examples of their calculations, and discusses the use of shrinkage as a basis for evaluating custom drying and grain sale alternatives. 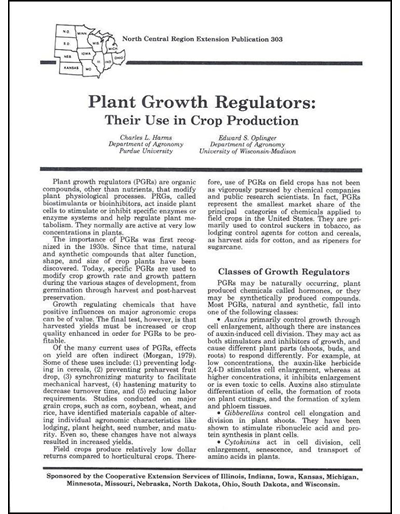 Plant growth regulators (organic compounds other than nutrients) and their effects on crop growth are discussed in depth in this publication. 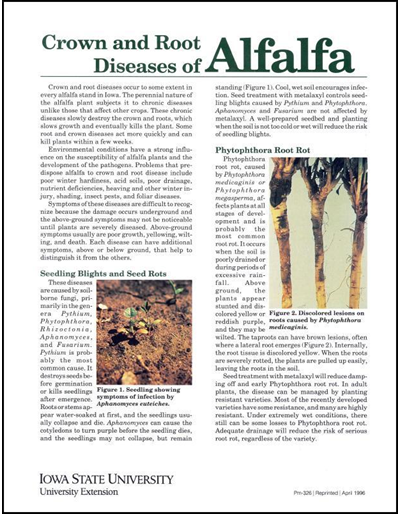 Topics include root growth, disease resistance, and stress tolerance and moisture relations of crops. The drying fan is one of the most important, and often least understood, pieces of equipment in a grain bin drying system. This publication addresses many of the common questions about bin drying fans. 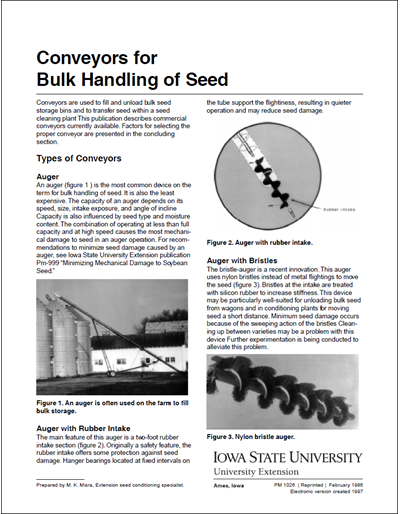 Conveyors are used to fill and unload bulk seed storage bins and to transfer seed within a seed cleaning plant This publication describes commercial conveyors available and how to select one. Corn is the only important cereal indigenous to the Western Hemisphere. 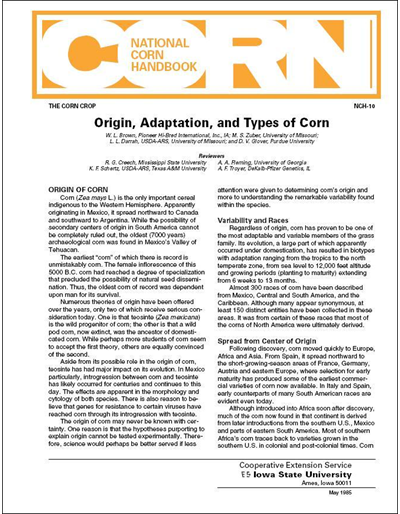 Find out about corn's origin, adaptation, and the different types of corn (dent, flint, flour, sweet, pop, and pod). 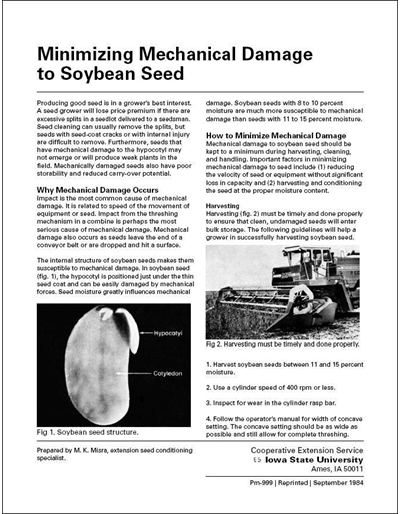 Basic information on why mechanical damage occurs to soybean seed and how to minimize it.